Today in Chile we are facing a positive economical scenario, with a projected growth of 6% for 2012. 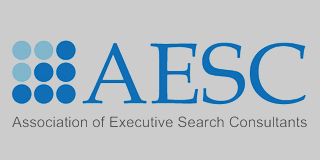 This is reflected by a practically full employment market, which has favored immigration of foreign (European and Latin-American) executives that have been attracted by interesting professional opportunities as well as by a sound and stable country. 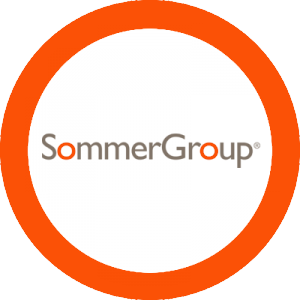 SommerGroup® International Search Solutions, based on its Executive Search processes, prepared a complete study that reveals interesting results. 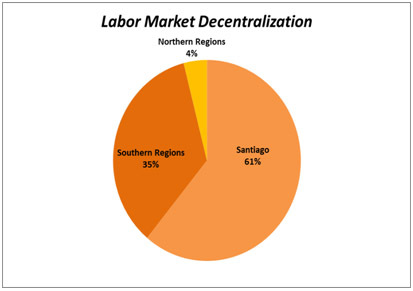 The purpose of this study was to a) measure the behavior of the Chilean Labor Market, based on the requirements of its clients and the number of contracts in 2011, and b) compare these contracts with the figures from the previous year (2010). 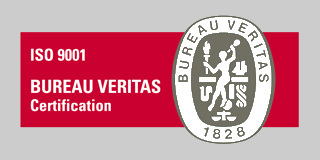 The research included SommerGroup® ‘s Clients that are leaders in their business activities in the local Market, important representatives of the Mass Consumers, Retail, Salmon/Forestry, Telecommunication/Transport, Mining/Energy and Fuel sector, mainly. 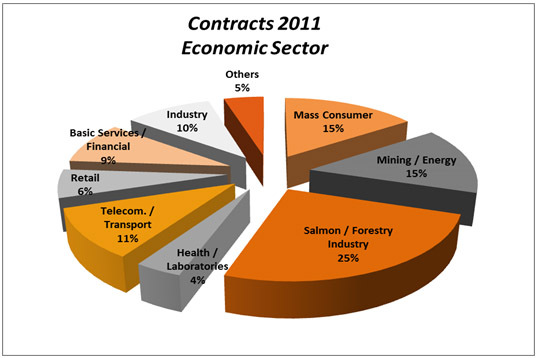 Business activities that particularly showed higher recruitment demand in 2011 were the Salmon/Forestry Industry with 25%, Mining and Energy and Mass Consumer with 15% each and the Telecommunication and Transport sector with 11%. 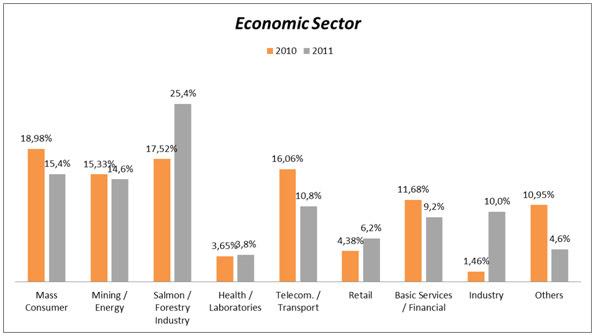 If we compare these sectors with the Executive Search processes by SommerGroup® in 2010, those experiencing greater recruitment increase in 2011 were the Industry sector, which grew by 8.5 percentage points, then the Salmon/Forestry sector growing by 7.9 percentage points and, finally, the Retail sector with an increase of 1.8 percentage points. If we compare 2010 figures, we can see an important increase in the number of contracts in Commercial/Marketing and Projects (5 percentage points) and IT (3 percentage points) areas. 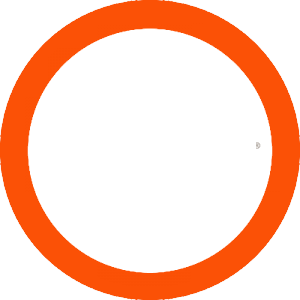 “This can be easily attributable to the market and economy of a growing country, which create the need to prospect new businesses and invest; thus, generating and job increase in Commercial and Project areas, which are sustained by Technological solutions (IT). 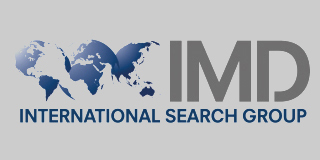 Recession and shortage times trigger the opposite response, when finance and management control areas share the highest recruitment demand” claims Ximena Rodriguez, Partner and Client Manager at SommerGroup® International Search Solutions. Likewise, a significant increase in contracts was experienced in the Chilean regions, mainly in the South, where the market is focused on the Salmon and Forestry industries. 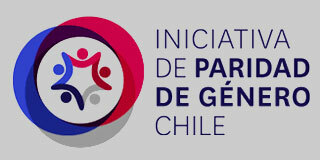 In Ximena Rodríguez’s opinion, “We closed 2011 with 40% of contracts coming from regions from the South of Chile. This significant increase shows the progressive growth of the region, resulting mainly from the international expansion of the salmon and forestry industries”, explained SommerGroup®’s partner.